A salmon roll topped with mayo and onions. Sushi is pretty big here. Almost any big catering company in Hawaii carries platters of sushi. Rolled sushi, nigiri sushi, maki-zushi…you name it, we’ve eaten it. I’ve spent a lot of time in Japan, too. And I can tell you that there’s a difference between Japan sushi, Hawaii sushi and mainland sushi. Each has their own preferred flavors and unique creations, so if you love sushi, it’s a good idea to branch out and try a few bites while you’re in paradise. This particular outing was for a business meeting of 3. We had a fantastic time choosing rolls from the specialty menu and sharing with each other. I’d suggest budgeting $20 per person and you’ll have a happy and full stomach. 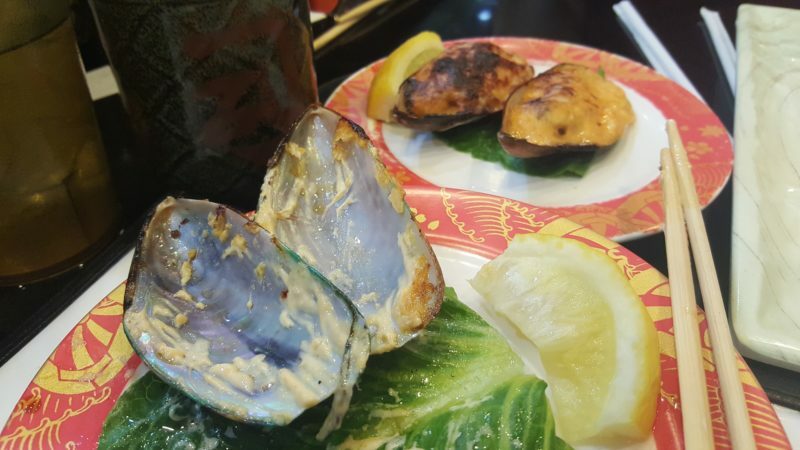 To get to Kazoku Sushi, head to 338 Kamokila Blvd #102, Kapolei, HI 96707. There’s plenty of parking and several other eateries in this area if you want to stroll and have a look. The awesome thing about conveyor belt sushi is that everyone gets to eat what they want. You have the freedom to eat (or not eat) to your heart’s delight. The only things that will restrict your hand moving to the conveyor belt is your belly and wallet. But because Kazoku Sushi also has 18 specialty rolls, you’ll get to have a taste of fancy while sharing the cost. I suggest at least 1 specialty roll for every 2 people in your group, then fill everything else up with appetizers and individual orders. To get the most bang for your buck at any conveyor belt sushi restaurant is to be strategic. Rather than ordering what you want to eat, find out what everyone wants to eat so that everyone gets a taste. Local Tip: The baked mussels were absolutely delicious! Can’t you tell? Baked mussels were so worth it. Kazoku Sushi is located in Kapolei, which means this is a convenient stop for visitors staying at Ko Olina or anywhere in West Oahu. It’s a small restaurant. If you come with a big party, come early or late when traffic has died down. 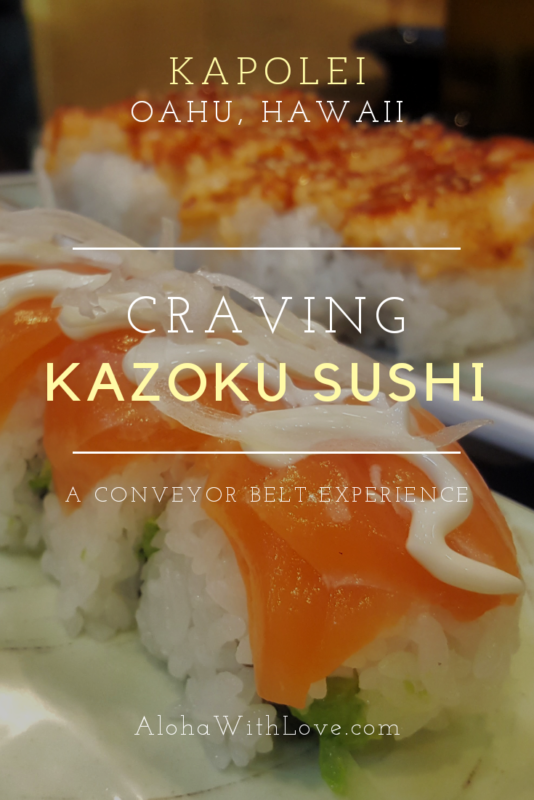 Unlike most conveyor belt sushi shops that are large and max out the space-to-person ratio, Kazoku Sushi is tiny in comparison. But I’ve found that service is generally quick and expedient. I’ve heard of people eating here and finding themselves disappointed when they’re stuck with a big bill. Be smart and aware with your ordering. If you’re choosing all high-end dishes, don’t be surprised when the register starts flashing triple digits at you. Don’t be afraid to ask for something specific if it isn’t showing up on the conveyor belt. Another great question to ask the sushi chefs is what’s fresh for today. There’s an all-you-can-eat option, but I still wouldn’t recommend it as it’s pricey and most people only eat their favorites when it comes to sushi. Our "fancy sushi" minus a couple of conveyor belt plates. The red dragon roll is wonderful. A rolled shrimp tempura topped off with tuna, green onions and a shoyu-based sauce. You already know I loved the baked mussels. I personally love anything salmon. It’s a good fish to start off with if you’re just venturing into raw fish sushi. It’s natural fattiness makes it more creamy than other ocean fish. The oysters are probably on the small side compared to what most people are used to. But they taste awesome at Kazoku Sushi. For those who love raw shrimp, try their amaebi nigiri sushi. If you’re absolutely not into sushi, but everyone else in your party is, I’ve heard fantastic things about their ribeye! Try it and let me know! A bite of the red dragon roll before it disappeared. Kazoku Sushi is located in a small shopping area, which is next to a larger shopping center called Kapolei Commons. There’s another conveyor belt sushi shop nearby called Genki Sushi, but I’ve never been impressed each time I’ve gone so I suggest skipping it. 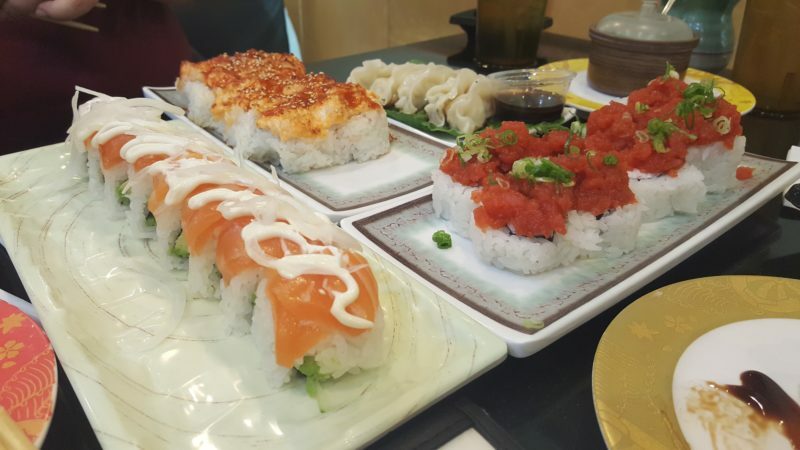 Kazoku Sushi will deliver a higher quality meal, more menu options, and better all-around service. 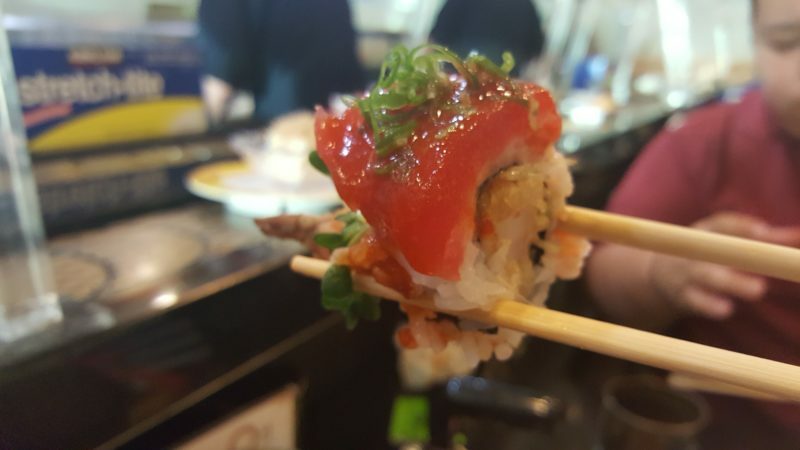 If you enjoyed this post about Kazoku Sushi in Kapolei and plan to visit Hawaii someday, sign up below to get my local Hawaii tips. It’s free and I can’t wait to help you plan the perfect Hawaii vacation.